In that light, the most disturbing thing about the arrest last week of Leslie Chew, a Singaporean cartoonist, is that he appears to have been targeted for asking, through his cartoons, a very pertinent question: is there institutionalised discrimination against Malays in Singapore? This is not a new assertion, yet it rarely gets the proper treatment it merits. Those who believe that Singapore has succeeded in building some multiethnic utopia might balk at the suggestion. And yet there is plenty of fodder to support it. Three women were brought to the Singapore General Hospital, each in the same condition and each needing a blood transfusion. The first, a Southeast Asian was given the transfusion but died a few hours later. The second, a South Asian was also given a transfusion but died a few days later. The third, an East Asian, was given a transfusion and survived. That is the X factor in development. This world view was not unique—it is worth noting that Mahathir Mohammad, Malaysia’s prime minister from 1981-2003, cited genetic differences as one of the key justifications for bumiputera affirmative action in his seminal work The Malay dilemma. Mr Lee has recently said things that might offend many Malays. Mr Chew’s cartoon portrayed a high-level corporate dialogue in March, where Mr Lee suggested that companies in Singapore can recruit talented Chinese, Indians and “Caucasians” workers. The Malays were conspicuous by their absence. Given his overarching presence in Singapore over the past 50 years, one wonders what impact Mr Lee’s views on Malays—and Chinese and Indians, for that matter—have had on Singapore’s politicians and citizens over the years. Separately, as Mr Chew’s cartoon did, one might also point to the fact that the proportion of Malays in Singapore’s population has been declining over the years despite them having higher fertility rates. The reason is simple—Singapore has been naturalising relatively higher numbers of Chinese and Indian migrants. Singapore can argue that its policies are guided by realpolitik considerations, not racial ones. However, even if “pragmatism” is the cherished ideal that drives these policies, we must accept that their ultimate impact might be to disenfranchise Malays in society—hence sowing the seeds for institutional discrimination. Given all that, is it really wrong for Mr Chew to probe the way he does? To be clear, I do not want to suggest that the government actively discriminates against Malays. But I am convinced that, given the available evidence, it is an argument that must be entertained, not dismissed offhand—to say nothing of calling in the police. One might disagree with how Mr Chew framed the discussion. “Damn racist government!” is not the most flattering descriptor. But that is certainly not the first time I have heard that phrase muttered in this country. Moreover, Mr Chew is not in the business of writing diplomatic pleasantries. In a mature, thinking society, we need to accept—even celebrate—artists who ply their trade across the socio-political spectrum. Mr Chew’s cartoon presents an opportunity for society to debate these fundamental issues. Does Singapore need to maintain ethnic proportions in society? Why does Singapore not have as many Malay immigrants? If there is, indeed, institutional discrimination, what can be done about it? Race and religion have long been taboo topics in Singapore. But the salient point here is that given our level of economic and political development, it is absolutely crucial for society to start having open, honest dialogues about them. Many Singaporeans have been shocked by the uptick in racist and xenophobic sentiment in the country—online and offline—over the past few years. But by suppressing discussion and dissent, we simply encourage opinions to fester in silos. That is a climate in which bigotry thrives. You have put in writing the thoughts of many in Singapore and they resonate .I wish you well. The interesting thing about Singapore is that, if X is offended about something that Y wrote, due to race, and started a riot, our society somehow feels that Y should get the blame rather than X. That must first change for there to be a frank discussion about race issues. Riot?…what say riot and mayhem…? The world has changed and different from twenty years plus ago. Even the Malaysians are no more afraid of May 13 repeating or resurrecting. Who to gain to talk about past riot and mayhem. THAT is hitting the nail on the head …!! That particular cartoon about race, to me, is not the real issue. Neither is the one about AGC. These are red herrings. 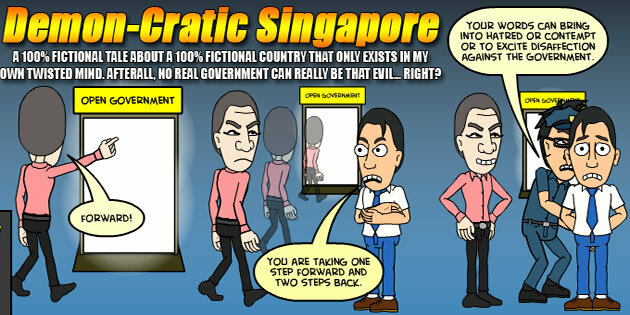 There are other more damning cartoons in Demoncratic Singapore that are too close for comfort – but of course they cannot single out those real culprits. Talk about the Streisand Effect. Go see for yourself which are the cartoons that are really objectionable. Thank you, sir I so agree. I stopped reading your piece right there. I sincerely hope you’ve put it there only because of fear. It should be read together with the sentence after that. You have a point there. But sadly some quarters of the malay population are ruining the credibility of those genuinely hardworking and educated malays of equal standing in society and employment. I sincerely hope that these group are given their equal rights and opportunities and not being discriminate as a result of those that are giving the race a bad name.